The Newaygo County People for Peace are focusing on Thirty Days of Peace offering videos, talks, walks, readings and more in our county from September 10- October 10. Their mission is to promote peace and justice starting with the individual and spreading out into the world using both education and nonviolent action. They are advocates for social justice for those who have no voice, to make nations and governments accountable for their military, social, environmental and economic actions. People talk about peace in one sentence, but throw their hands up in defeat in the next believing it is impossible to achieve peace in their lives, locally, nationally, and internationally. Instead of giving up, we need to learn more and begin right in our own neighborhoods to find solutions. Learn more about the Thirty Days of Peace at the The Newaygo County People for Peace page. Tuesday, October 1--Karina Fabian stops on her book tour for her new release, Mind Over Psyche, and is offering a giveaway of an electronic copy. Wednesday, October 2--It's the first Wednesday of the month and time for a blog hop with the Insecure Writers Support Group. 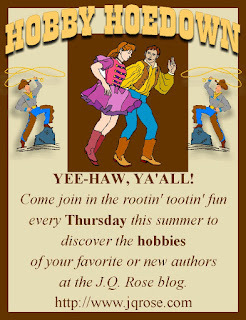 Thursday, October 3--Hobby Hoedown features author Lorrie Struiff and her take on her numerous hobbies through the years. The Month of October--Join in the fun with the Christmas in October Giveaway with Penny Estelle and 50 other authors! It is almost upon us. Only one more day! six different authors will be spotlighting their books. Some lucky commenter is going to win over 50 different prizes. It could be you! All you need to do is comment. all of these fabulous prizes!